The future of news media: Far in the distance or right here and now? Note: This is an unedited analysis of a State of the Media article that was posted as a project for an introduction to newswriting and reporting class at Sac City College in 2011. It does not represent my current work as a journalist. On “The State of the News Media” website there are several articles discussing the current state of the media based on numbers, statistics, and other findings from 2010. One of the articles discusses the state of online media. The article summarizes several pieces of data about online media. Some of the areas the article discussed were ad spending trends, subscription model and user fees, audience and digital economics. Perhaps the most interesting part of the article was the section about audience. 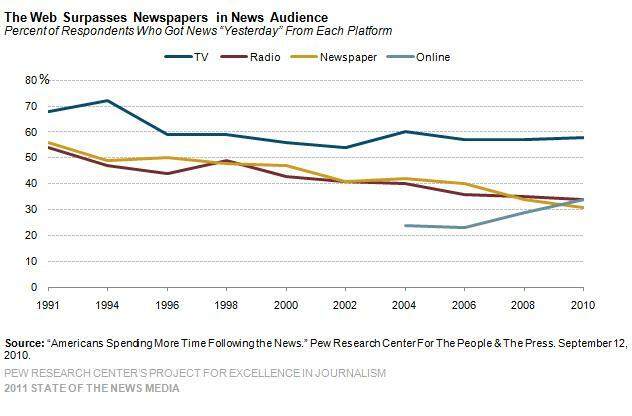 The article showed the line chart pictured above, and discussed the generational changes in how people in America receive and follow their news. The chart lists several outlets such as radio, online, and television. According to the data, from 1991 to 2010 trends in TV, radio and newspapers declined steadily but online inclined at certain intervals. As you can tell from the chart, TV saw a drop between 2000 and 2002 and then jumped through 2004. After that it saw a steady decline until it recently tapered off. Online shows the most significance of a jump in 2006 as it jumps quite largely. In fact, from 2008 to 2010 the numbers jumped 29% for online news viewing. The data in the article says that though TV remains in the lead, online is quickly catching up and has already surpassed TV with younger crowds. This means that publications which publish physical forms of their newspapers or magazines are not only losing readers but also revenue. The increase is significant; however, classic publications shouldn’t be alarmed as most of the online news was obtained from those same publications’ online formats. For me, I definitely see the future in online media; not only with news but with everything. Television itself is becoming more and more web-based and eventually the lines between online news media and television news media will blur. I think it’ll take a little more time and the changing of generations from the baby-boomers to modern generations before physical media will die out. This goes not only for written news media but for music, movies, video games and even books. The only question left to answer is whether this future is really all that futuristic or whether the future is now. This entry was posted in Newswriting & Reporting (Journalism 300). Bookmark the permalink.